Words On A Mountain – The ramblings of Sam Harrison, from the fell sides of the UK and further afield. The ramblings of Sam Harrison, from the fell sides of the UK and further afield. I’ve finally got around to making myself a website, and so with some sadness this will be one of my final posts on this little blog I’ve kept going over the past couple of years. Fear not though, all the posts have been moved over to my new website and I will of course continue to post there. I’ll also keep this one open for the time being at least. And where is this new website, I hear you ask? If you enjoy reading my posts then I urge you to “subscribe” to me – there’s a box you can fill in with your email address on the home page – and you’ll get an email from me every time I post a new entry. There is (as there is on this blog) the option to comment on posts as well, and I’d love to hear comments from anyone that reads my blog, if for no other reason than it’s nice to know who actually reads it! So, farewell WordPress and I hope to see you all over on my new site! P.S. I’ve just completed my first post over there, which can be found here. P.P.S. Some of the older blog posts might look a bit “funny” over there at the moment. Unfortunately transferring stuff across from WordPress to PyroCMS (the content management system I’ve used for the new site) isn’t that simple and requires quite a bit of manual editing, which I’ve done for the most recent 25-or-so posts but haven’t had chance to for the old ones yet. Likewise with comments. It’s been a busy start to the New Year – I’m working on three websites at the minute (including one for myself, watch this space!) and I’m also doing teaching assistant work alongside my PhD – which explains the lack of posts recently. 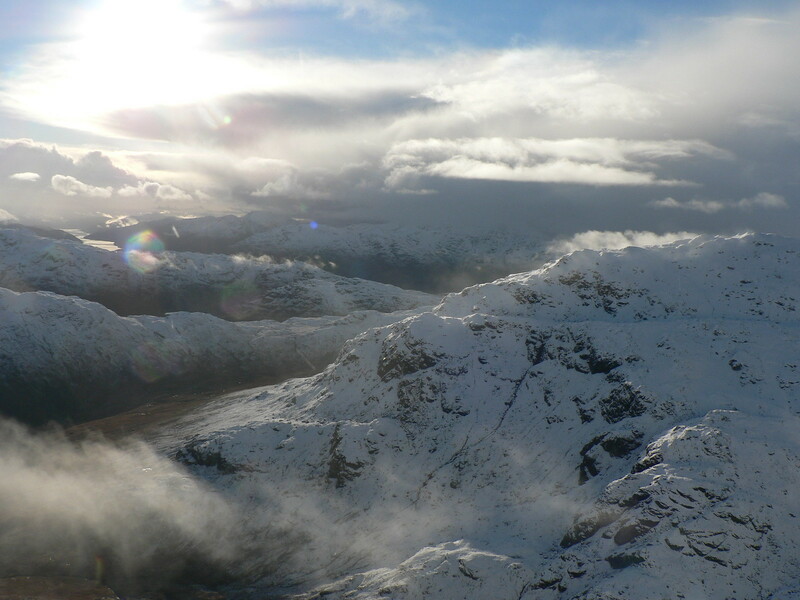 The week after New Year’s, from 4-11 January, a group of 19 of us from Lancaster University Hiking Club headed up to Glenshiel for the annual club “Winter Trip”. Two years ago, we went to Badrallach, near Ullapool, and got blighted with all manor of bad weather, culminating in some of the worst storms Scotland had seen. The year after, we spent the week in a couple of cottages in Roy Bridge. 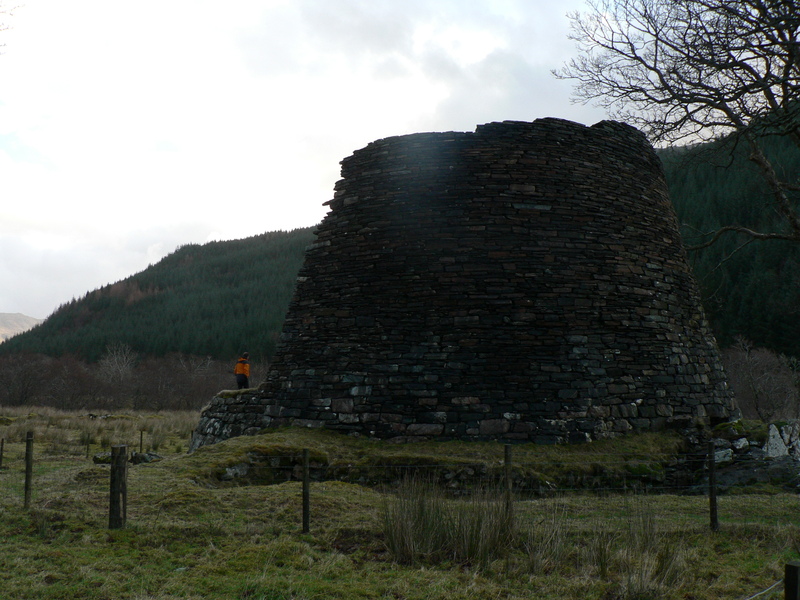 The weather was better (marginally), but I was injured and hence out of action. Hence, fingers and toes were crossed for some better luck this year! The week started relatively well, and with a 7am start on the Sunday we almost managed to beat a band of bad weather heading in at midday. Our walk, the three Munros of Carn Ghluasaid, Sgurr nan Conbhairean and Carn na Coire Mheadhoin, was picked strategically to be as east as possible (within reason) to again minimise the chance of the weather, which was coming in from the west, hitting us. The early start paid off as we got a few good views from the first summit, though things deteriorated from then onward. 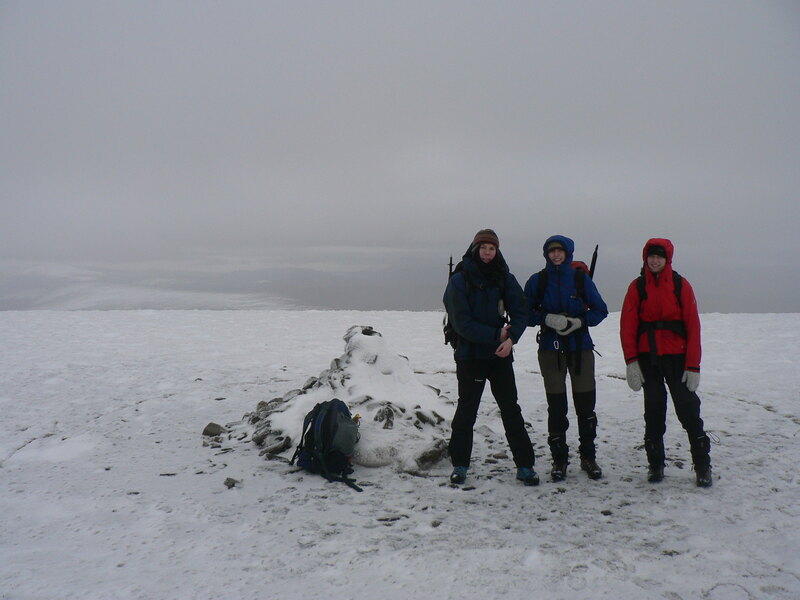 By the time we were returning from the third Munro the conditions were “full-on Scottish winter” – i.e. white-out and blowing a gale – which meant that as we descended below the freezing level the snow turned to rain and by the time we reached the road for the 3km walk back to the car, we were already soaked. I left my bag with Lorna and ran on ahead to pick up the car. Some of the others had been less willing to leave their beds earlier and by all accounts got the brunt of the weather on the third Munro (good navigation practice at least!). Good time for navigation practice! 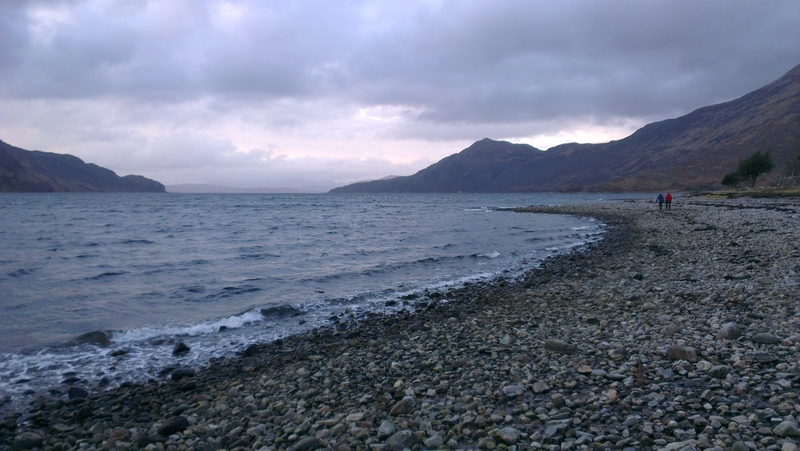 Monday had already been written off to a 110-mile tour taking in some of the highlights of the ruggedly beautiful western coast of Scotland, including Sheildaig and Applecross. 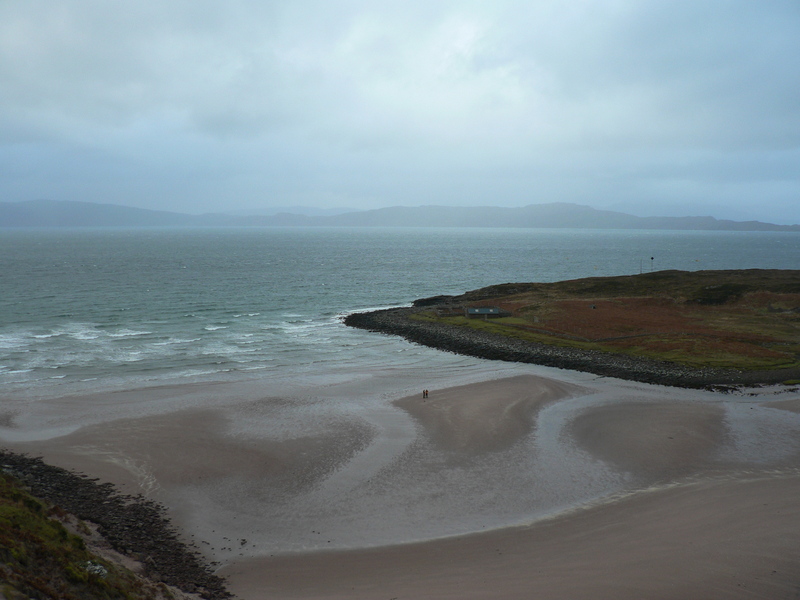 The sandy bay of An Cruinn-leum offered some fantastic sand dune running and impossible bouldering, whilst the pub in Applecross provided a very welcome coffee. Tuesday wasn’t any better, but with the amount of water that had fell out of the sky over the past few days, we decided the Falls of Glomach were at least worth a visit. This also had the advantage of giving the opportunity to ascend the Munro A Ghlas-bheinn should the weather improve: It didn’t, but a few of us went for it anyway! 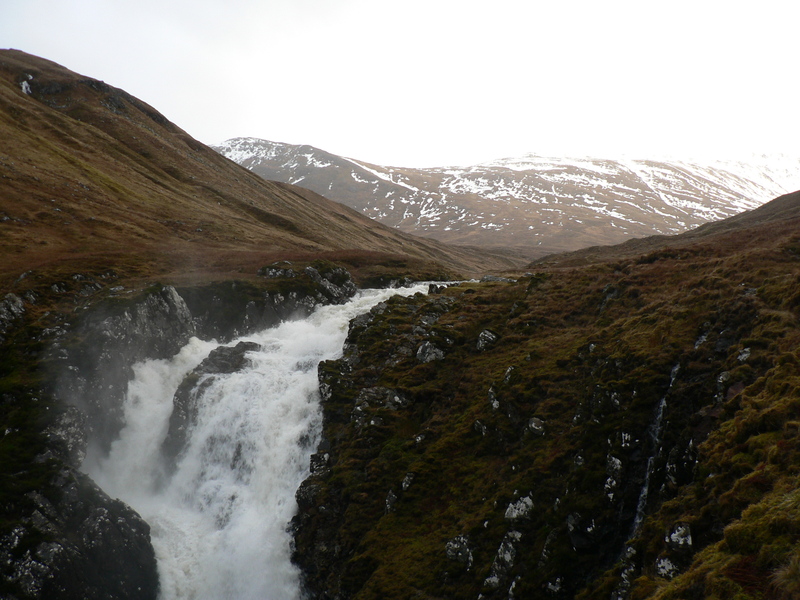 The Falls were mightily impressive, both in their height and also in the amount of water plummeting over them. A Ghlas-bheinn was surprisingly good fun, and although it didn’t stop raining the entire day, a steep snow slope up to the summit and a devious route down just about made it worthwhile. I always think it feels more rewarding when you’ve been out and done something relatively big even though it’s awful weather. Wednesday; more of the same! Lorna, Imogen and myself drove to the start of the Five Sisters, sat in the car hiding from the rain for a while, and then drove back. Some of the others got halfway to the start of the Forcan Ridge and then decided to head back. It did mean that I got the chance to go for a long run: Up Coire Uaine, over its western col to the Ratagan Forest, around the Ratagan Forest for god-knows-how-long trying to find my way out (the map lied! 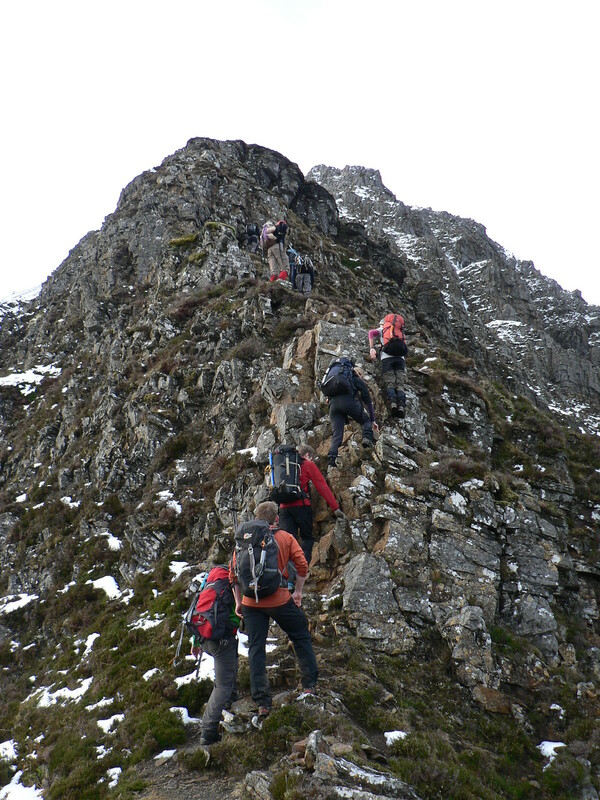 ), over the hill and subsidiary tops of Sgurr a Bhraonain and then back down the road to Sheil Bridge. Thursday now seemed like our only hope, with the forecast bad again for the following day. It was hence time to make a second attempt at the Five Sisters, and so whilst Jim, Ben and Stephen retraced their steps from the previous day up to the start of the Forcan Ridge, and as Richard et al. were enjoying the South Shiel ridge, Lorna, Imogen, Darren and myself were tackling the relentlessly steep slope running at an average angle of 35 degress from the A87 to the summit of Sgurr nan Spainteach. The snow was frustrating at best; at first it appeared solid on top, but every couple of steps you’d sink right through to knee-depth (or deeper!). That being said, I do love a good snow slope and I definitely enjoyed the 900m of ascent we polished off in under two hours. We did get the occasional view! Unsurprisingly, the views were nearly non-existent, except for a few breaks in the cloud here and there. The complexities of the ridge made up for this however; complexities not because of technicality, but rather because of the devious route it took, embracing everything from super-steep snow slopes (usually in descent) to twisting rocky passages. The descent from the third of the three Munros it passes over – Sgurr Fhuaran – was particularly steep and devious, and looking back at the summit from Shiel Bridge on a clear day, you can see why! Fortunately, the cloud level was high enough so we got a great view out over Loch Duich on the descent, a view which we couldn’t help thinking reminded us of the view of the Pap and Loch Leven from Sgurr nam Fiannaidh. Loch Duich and Sgurr an t-Searraich, aka the Pap of Glencoe and Loch Leven! The final day was again spent avoiding the bad weather, though in the end the bad weather didn’t turn out to be so bad! 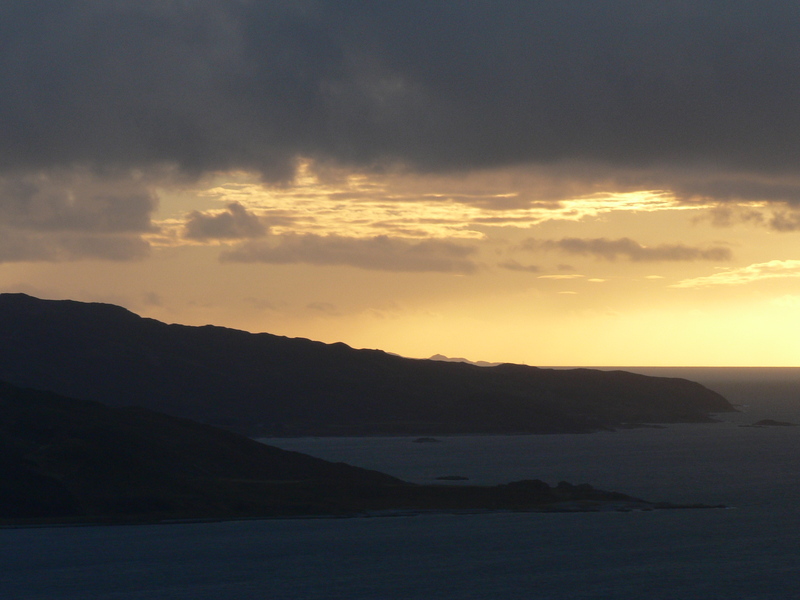 We visited Glenelg, the Brochs of Glenn Bheag and Arnisdale, and got some fantastic views of Rum and Eigg on our drive back from Arnisdale. Ironically, the best weather of the week by far was on the drive home on Saturday, with crystal-clear skies and beautiful snow-covered summits! The closest hills to Lancaster are the Bowland fells, and whilst we go there plenty enough for runs and bimbles, we don’t often make a full day out of it. My Mum and Dad were coming up to Lancaster for the day on Wednesday 11 December, and so I thought it would be a good opportunity to explore a valley I’d been looking at on the map for quite some time. 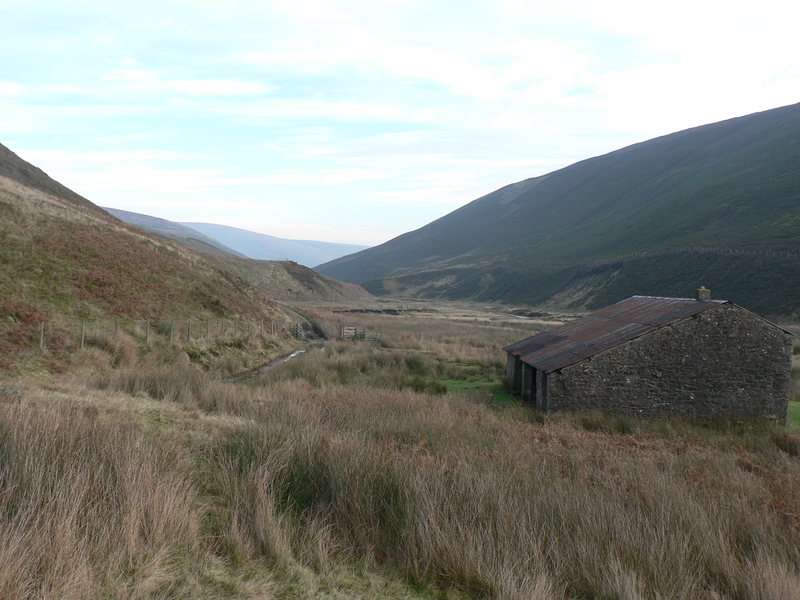 Namely Langden, rising from the Trough of Bowland just-north of Dunsop Bridge. The day was one of those cold, crisp and clear winter days, and despite the sunshine a biting wind reminded us it definitely wasn’t summer. A good track leads up alongside Langden Brook for a few miles, before reaching the site of “Langden Castle (ruin)” (as marked on the map). The castle turned out not to be a castle at all, but a small stone building that definitely wasn’t in ruins. After a spot of lunch, we worked our way south-westwards on a good path that traversed its way up Fiensdale before throwing us out onto the expansive moorland at the top of Fiensdale Head. Fortunately, a fence was in place to guide us across the moor, and a vague path existed either side of it. A few flag stones were laid here-and-there, but for the most part we had to negotiate peat hags and vast bogs, which I have admit that I quite enjoy doing – I think for the same reason that I enjoy stupidly steep slopes, that “it’s a challenge”. 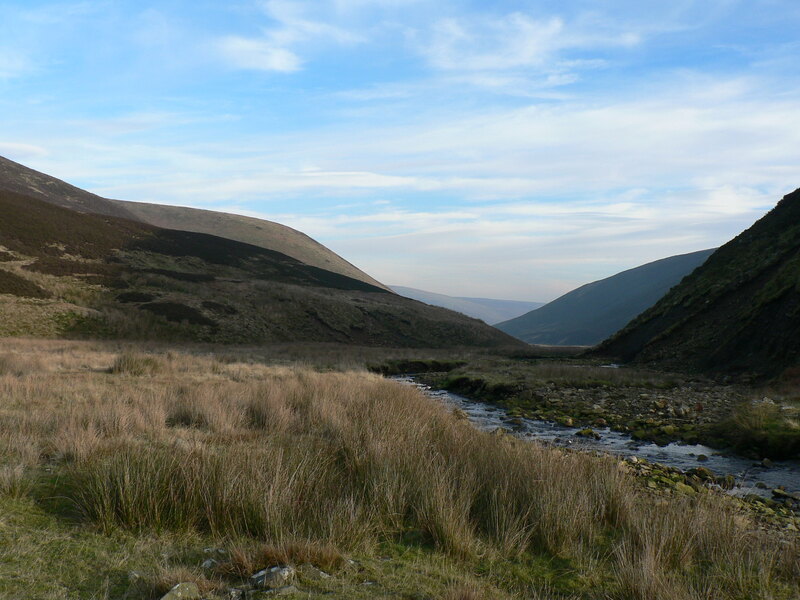 The views aren’t amazing from up on the Bowland summits – they are too plateau-like for that – but you do get a real feeling of wilderness, despite being relatively close to civilisation. We descended via Bleadale and got back just about in the light. ‘Tis the eve before Christmas (actually, it will be the wee hours of Christmas morn by the time I finish writing this post! 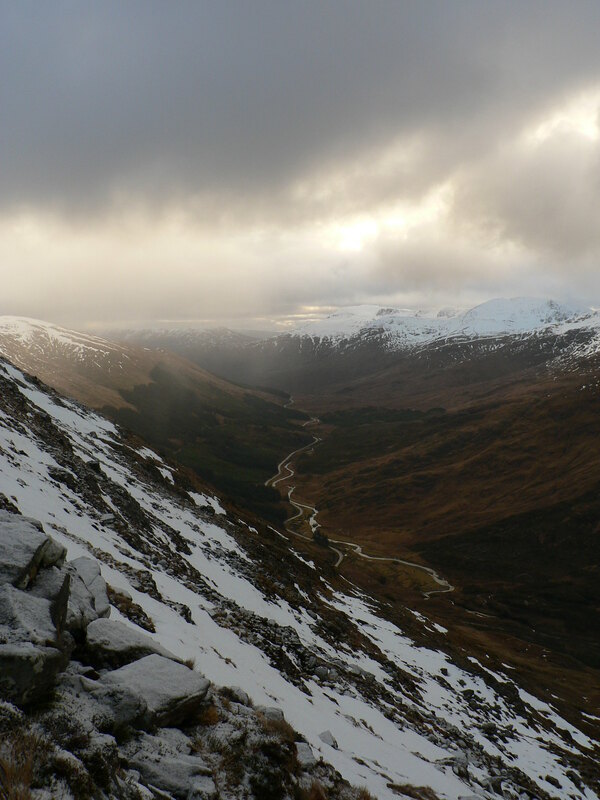 ), and to get you in a Christmassy mood and distract you from the storms hitting the UK at the moment, here’s a post about the snowy Cairngorms! I still stand by the statement from my post about a backpacking trip to Braemar in February, that the Cairngorms is one of my favourite places in the UK. I love the wilderness, the vast scale of the mountainous terrain and the unique flora and fauna, from glens full of distinctive Scotts Pines to snow-white ptarmigans camouflaged against their snowy backdrops. For the second year on a row, the Hiking Club decided to put on a winter skills course – provided by Paddy Cave from Mountain Circles – to introduce newer members to the world of winter walking, taking place on the weekend of Saturday 7 December. The rest of us took the opportunity to get out and do some quality walking in the area. Initially people had been talking about all sorts of routes, from Braeriach to Bynack More, but in the end we decided it was much easier to all head down to Glenfeshie for the two Munros to its east. The most northerly one, Sgorr Gaoith (aka Sgorr Gooey), a group of had done the year before, but the most southerly, Mullach Clach a Bhlair, most of us hadn’t. Some guys opted for an anticlockwise route (Mullach Clach a Bhlair first), with the option to miss out Sgorr Gaoith. Lorna, Imogen and Darren opted for Sgorr Gaoith first (which they hadn’t previously done) and in a bid to prove it’s not just about the bagging, I tagged along. Despite the relatively good forecast, the clouds blanketed anything above 600m and there was a fairly strong wind to contend with. We’d had snow down to campsite level on Friday night, but the temperature quickly rose as the day progressed, and by the time we returned on the Saturday evening, it had all melted. After the usual excessive faffage on the campsite, we finally left at 8.30am and we were walking for soon after 9am. A good path lead us on a pleasant walk up through the Inshriach Forest and onto the western shoulder of Sgorr Gaoith. The path soon petered out as we made our way up the shoulder and onto the summit, using the opportunity of a partial white-out to practice our navigation skills. It was more micro-nav all the way across the plateau to Mullach Clach a Bhlair, and we made use of pacings, bearings, timings and plenty of contour traversing (namely around Carn Ban Mor) to reach the final summit. The descent to Glenfeshie was via a 4×4 track that runs nearly to the summit of Mullac Clach a Bhlair, meaning we were down in the valley in less than an hour, and managed to make it back to the minibus in just enough light to save using head torches. Summit of Mullach Clach a Bhlair, complete with “auxiliary contour”. Good track all the way down from the summit. I had planned all along to go for a run on the Sunday, and choosing Loch an Eilein as the location for the venue fitted well with dropping some others who were going Corbett bagging north of Glenmore. Me and Lorna have been for a few walks around Loch an Eilein in the past and its one of my favourite places in the area; indeed, it got voted “Britain’s best picnic spot” back in 2010! My run comprised of the small hill Ord Ban (which offered surprisingly expansive views of the surrounding mountains), followed by a loop of the loch. The rest of the day was spent in a fantastic little tea shop called The Potting Shed, drinking plenty of coffee and sampling some of the impressive number cakes they had on offer. The place was charming and I’d highly recommend a visit to anyone in the area! There aren’t many places in the Lake District that I haven’t explored yet, but until a few weekends ago, the hills around Coledale was such an area. Whilst I’m not a Wainwright bagger by any stretch of the imagination, I do admit that I’m generally fond of ticking things off lists and my chosen list, in England and Wales at least, is John and Anne Nuttall‘s list of mountains in England and Wales over 2000ft (with a prominence of 50ft or more). There are 443 of them altogether, and I’m about halfway there. I’d chosen to run the route, which encompassed none-less-than twelve Nuttalls, to see how my fitness was fairing up on a big mountain route. It worked out at around 24km with 1600m ascent, and took 3 hours and 8 minutes. In stark contrast to previous weekends in Scotland, the weather was incredibly mild, and despite being in shorts and a t-shirt I still found that I was far too hot hacking up onto the north-eastern ridge of Grisedale Pike. The views were non-existent but the running still very pleasant along the ridge over Hopegill Head and out to Whiteside and back. There were momentary lapses in the cloud cover and I did got some good views out over north-western Cumbria. Grasmoor was a bit of a slog, as was the out-and-back to Whiteless Pike; I’d chosen to do Whiteless not because it lies on the natural horseshoe (because it doesn’t, at all! ), but because I’d never done it before. 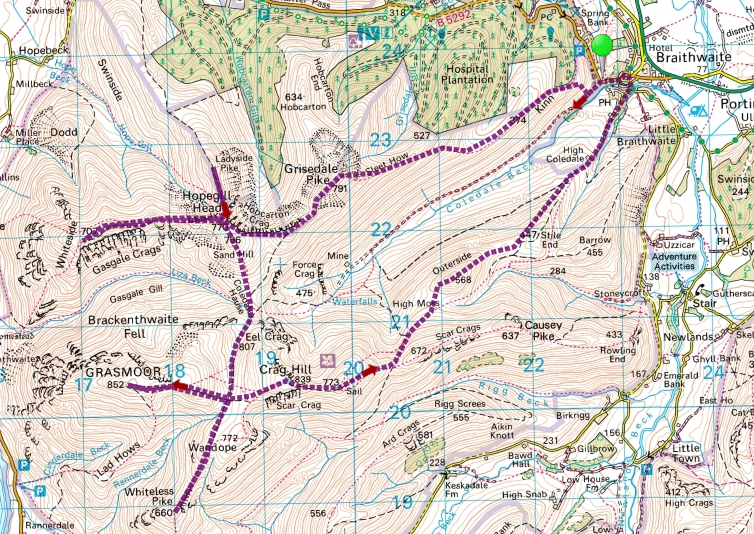 My original plan was to run back over Scar Crags and Causey Pike (two more Nuttalls! ), but that would have resulted in a couple of kilometres up the road, and so instead I descended via Outerside, which is instead I believe a Wainwright! This part of the route, despite my aching legs, was the most enjoyable of the day, probably due to the fact that I was finally out of the clouds. All-in-all, a very enjoyable day and I’ll definitely be back in better weather. 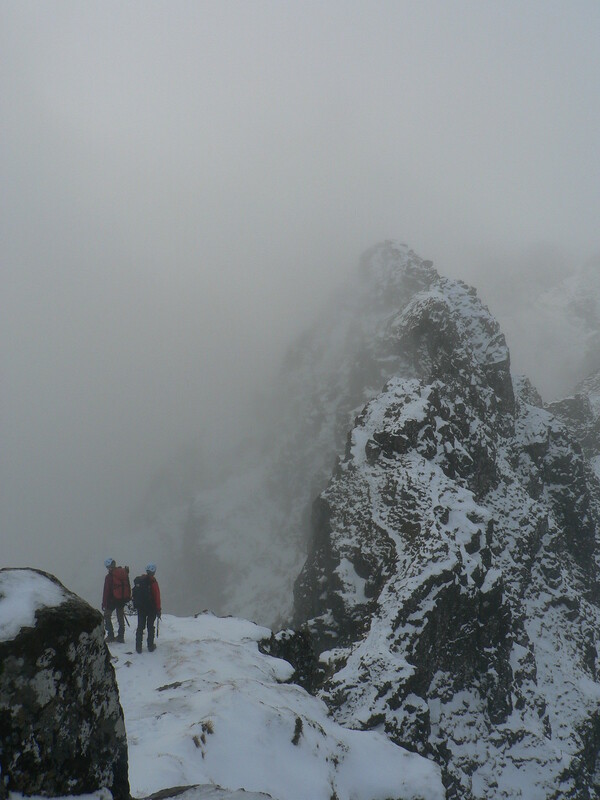 The words “Aonach Eagach” are enough to send shivers down the spine of many a hillwalker, conjuring up images up knife-edge pinnacles with stupendous exposure extending mile after mile after mile, finished off with all the complexities and challenges that the Scottish weather has to offer. Oft-described as “Crib Goch on steroids” and widely heralded as the “best ridge on mainland Britain” (it is presumably the Cuillin ridge on Skye that wins the overall “best ridge in Britain” title), the (in)famous Aonach Eagach ridge in Glencoe is a grade 2/3 scramble running between the summits of Am Bodach and Sgorr nam Fiannaidh, the highlight of which is a kilometre-long exposed section of “crazy pinnacles” from Meall Dearg to Stob Coire Leith. 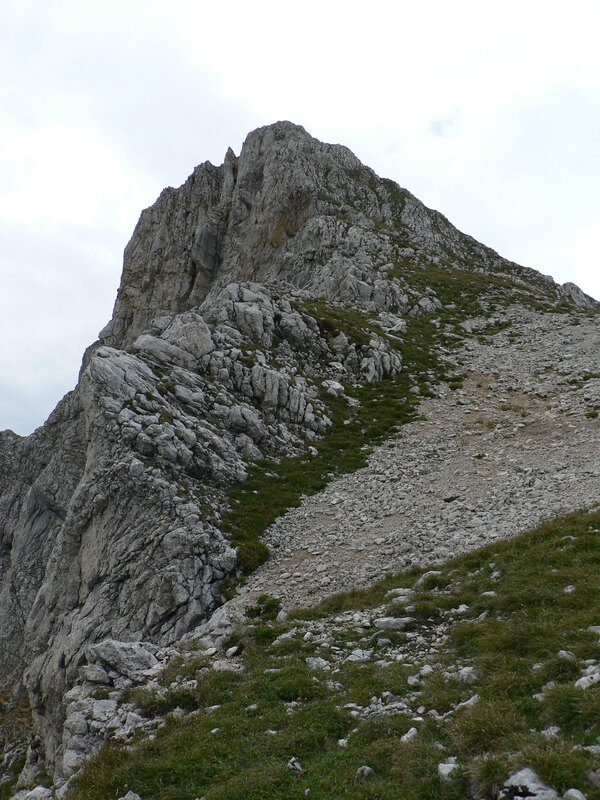 It is this section that gives the ridge its reputation and under a covering of snow makes the route a real mountaineering challenge, with a winter grade of II/III in the hardest of conditions. 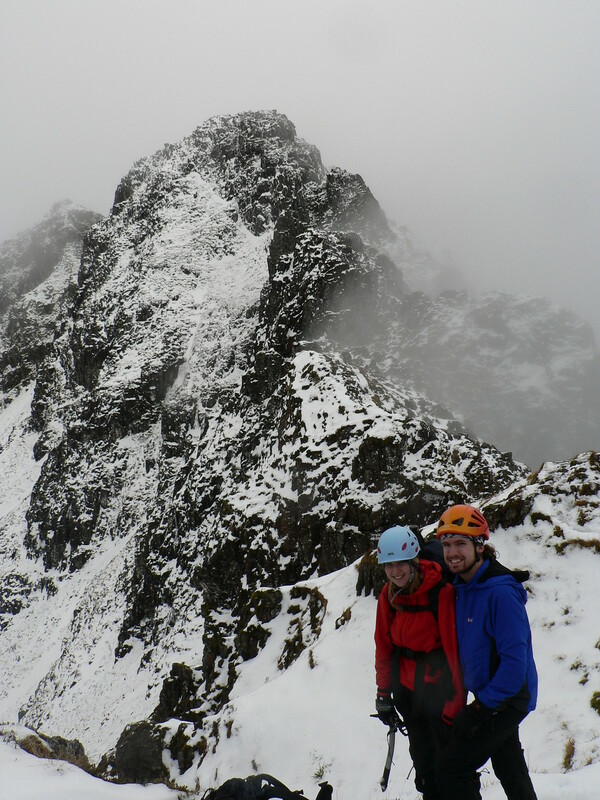 The name “Aonach Eagach” translates to “notched ridge”, which is an apt if not somewhat underwhelming description. Lorna, Imogen and myself decided that last weekend’s Lancaster University Hiking Club trip to Glencoe would be a perfect opportunity to do the ridge, and so with the sentiments of the previous paragraph running through my head, I found myself on the slog up Am Bodach at 8.30am last Saturday morning, after arriving in Glencoe at 11.30pm the evening before. 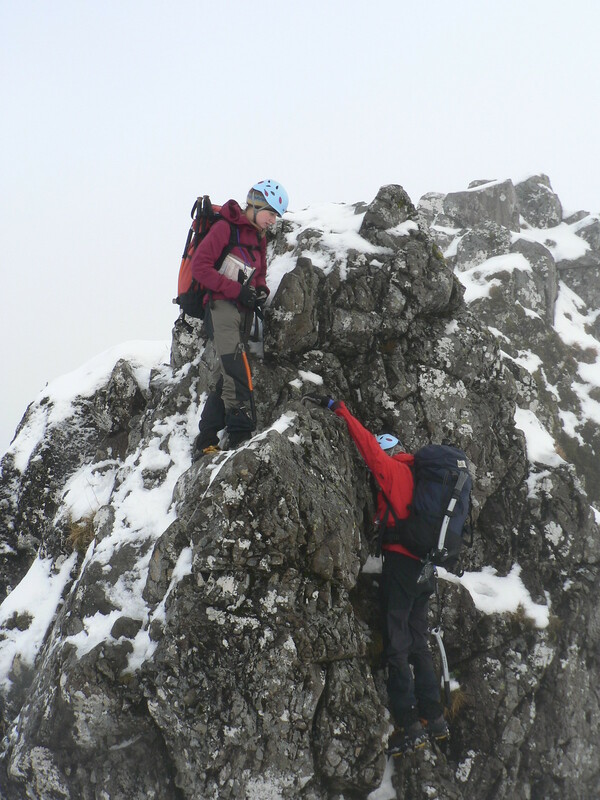 Lorna and Imogen had done the ridge before, in some deep and wet snow back in 2010, whereas it was my first time. On paper, the ridge shouldn’t have posed any problems for the three of us – in fact I’d read that it gets its grade more due to exposure and commitment, rather than technicality, and we’re all comfortable with exposure and used to commitment (the Alps is good training for that!) – but somehow the legacy and aura of the ridge still made me a little tentative. We’d packed climbing gear, comprising a half-rope, a few nuts and hexes, lots of slings and the usual harness, helmet and so on. 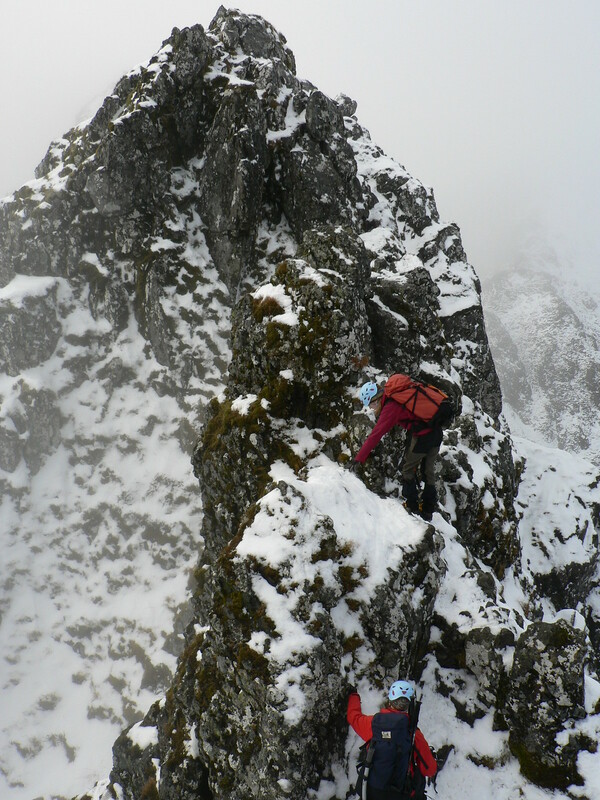 In the summer, the ridge is a sole-able scramble, however in the winter it is more common to move together on a rope and even pitch certain parts. We weren’t entirely sure how much snow was up there, but had imagined it would be a lot icier than it was. Crampons were donned before the first tricky steps down at the start of the ridge, but we decided to leave the harnesses off for the moment. The snow wasn’t too deep, and there wasn’t too much ice, making it easier going than we’d imagined. We soon found ourselves overtaking a roped party on the summit of Meall Dearg, before tackling the pinnacled section that, by that time, I was very-much-so looking forward to. It didn’t disappoint. The exposure was a-plenty (bar the clouds obscuring the view) and the scrambling challenging but extremely fun and long-lasting. I’ll spare the details, save to say that it lived up to its reputation as the best ridge in mainland Britain. We ended up taking our climbing gear for walkies, though others on the ridge were roped up and we noticed some newly-placed ab tat along the way. The early start was worth it, as we were back down at the campsite whilst it was still light, at just after 4pm. We bumped into the guys that we overtook in the Clachaig later on, and they hadn’t got down until 7pm, after descending Clachaig Gully. The ridge itself took us 3.5 hours from summit to summit. The scrambling fun didn’t stop after the Aonach Eagach! Lorna had suggested doing Sgorr Dhear’s NE ridge, and coincidently a few others had independently been thinking the same thing, so a fairly big group of around ten of us set off early on the Sunday morning. The ridge, which gets a winter grade of I, was exposed and not altogether straightforward in places, and to steal a phrase from the guidebook we were using, had “a real mountaineering ambience”. Other rather apt phrases from said guidebook describe it as an “easy but invigorating scramble” with “exposed aerial passages”. This all made the slog up to the ridge from sea level seem worth it in the end. The morning was overcast, but the sun did make an afternoon appearance as we were making our descent. By the time we were setting off back to Lancaster, the sky was clear! All-in-all, another brilliant weekend in Glencoe. Bring on next year! A common mistake in fell racing is to presume that the hillier the race is, the more difficult it will be. Arnside Knott fell race on Sunday definitely proved that to be false, as I arrived at the finish line more worn out than most other races I’ve done. It was definitely more intense than Great Whernside a few weeks ago. Lorna uttered something to me before the start to the extent of “make sure you’re at the front of the group at the start”, and with this in mind I soon found myself in sixth place, huffing and puffing my way up slippy limestone covered in even more slippy leaves. The “make sure you’re at the front” strategy was to avoid the bottleneck as the race route took us onto a little single-track footpath just after the start, and it worked perfectly. I was pushing myself to maximum intensity, but in a manageable way so that I could (almost) maintain my pace for the duration of the race. After just over a mile, the guy in front cramped up and I slipped up into fifth place. After a stretch of road the final ascent of the Knott began, and I managed to overtake once more, putting me into fourth place until the summit. I had lost sight of the lead runners by this point and all that spurred me on was the knowledge that I was being pursued closely. Go! Paul Webb, the winner, setting the pace at the start (middle of the picture). After dodging some curious cows standing around the summit trig, I started the descent, doing my best to avoid ploughing into those still making the ascent (the route is straight out and back), whilst valiantly trying to maintain my position. A real sting in the tail came in the form of a steep ascent about a mile from the finish, and at this point my legs decided they’d had quite enough ascent, allowing two guys who had been chasing me on the descent to finally pass. I managed to hang onto sixth position until the finish, frustratingly being only one second behind fifth place across the line. 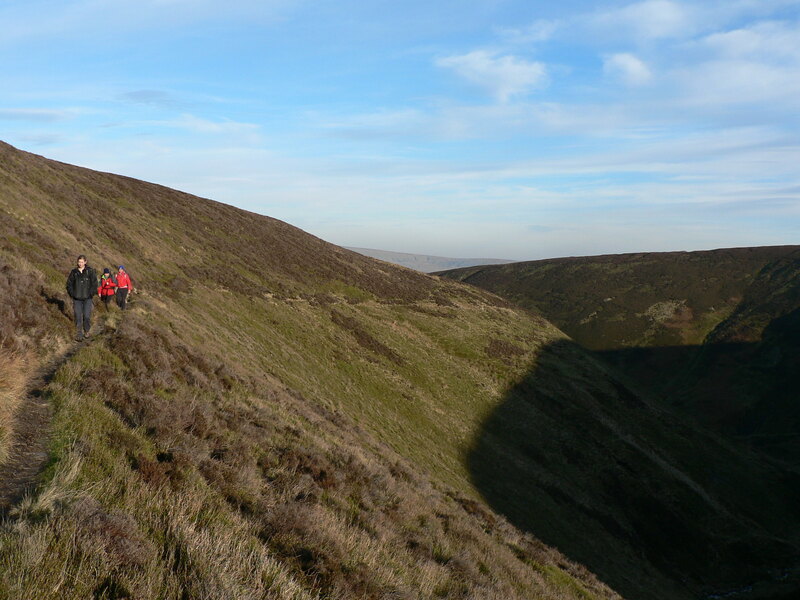 Heading for the summit – on the final ascent of the Knott. Photo copyright Mark Cronshaw. My finishing time was 37:48, whilst the winner (Paul Webb) smashed the course record by nearly two minutes, finishing in 34:56. The full results are available here. Nearly there! On the finishing straight. I thought we might get a little bit of snow for Lancaster University Hiking Club’s first Scotland weekend trip last weekend, but I didn’t envisage we’d be wading through waist-deep stuff most of the weekend. We were staying at Beinglas Farm Campsite, at the very northern-most end of Loch Lomond in Inverarnan. This offered easy access to not just the Arrochar Alps but also the Munros to the north-east of the campsite, on which I spent most of the weekend. The initial plan on Saturday was to bag all five Munros to the north-east of the campsite, namely: Beinn Chabhair; An Caisteail; Beinn a’ Chroin; Cruach Ardain and; Beinn Tulaichean. However, logistics dictated that only four (missing out Beinn Chabhair) were realistically going to be achievable and so we headed up to park just south-west of Crianlarich to start the walk up Coire Earb. The weather was pretty miserable at first, with plenty of sleety snow as we hacked our way up onto An Caisteal’s northern ridge. 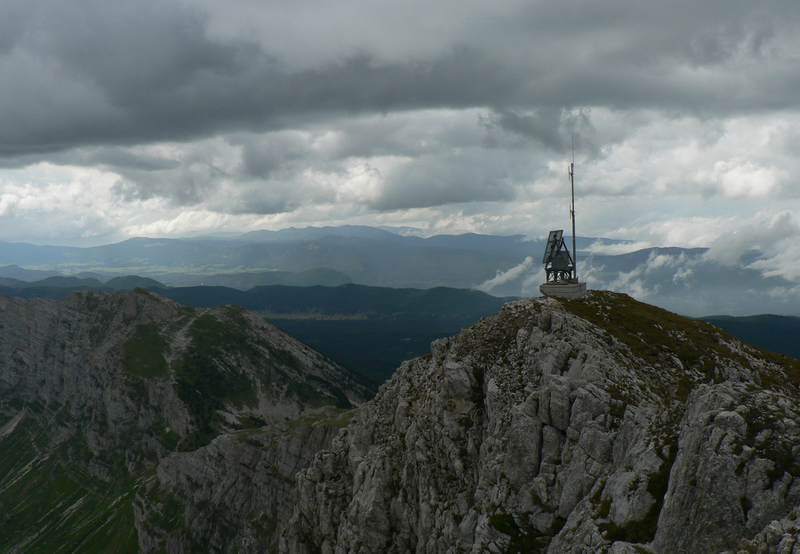 Things cleared up, fortunately, and we even got a bit of a view from the summit. 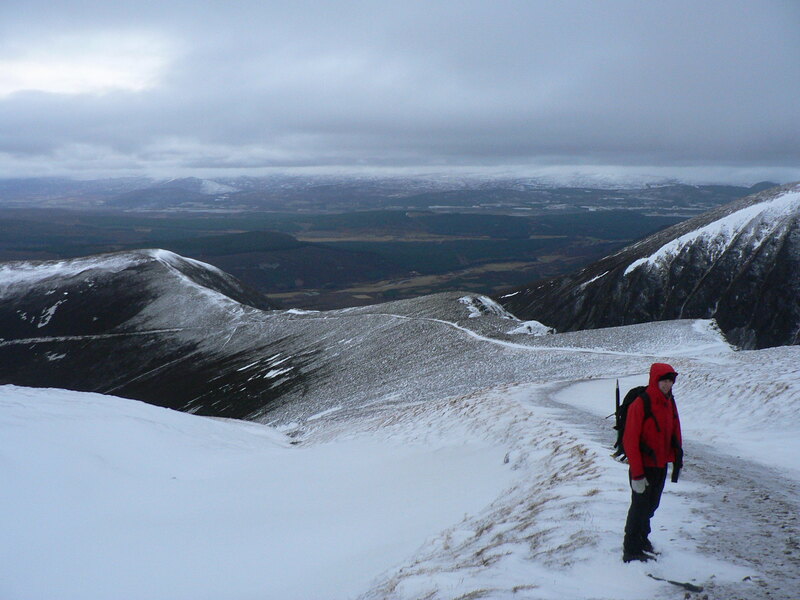 As it was the first fall of snow, no freeze-thaw cycles had occurred and hence it was all very powdery and pristine, which made for hard going as we waded our way onto Beinn a’ Chroin, via a steep, exposed and somewhat direct route up it’s north-western face. 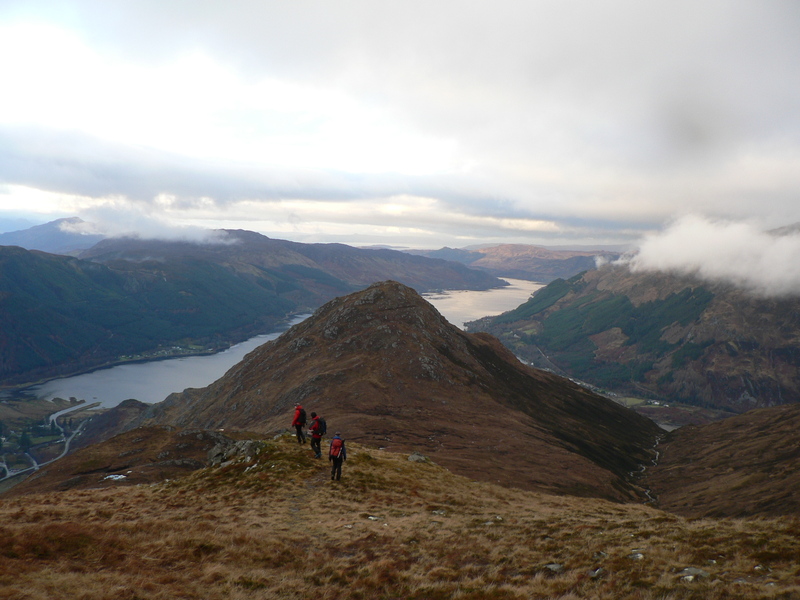 The clouds cleared on our way up and we got some stunning views over the surrounding Munros and down to Loch Lomond. Pristine powdery snow! Just off the summit of An Caisteal. The wind was biting and I don’t think I really warmed up all day long, even on the ascent. When we reached the col between Beinn a’ Chroin and Cruach Ardain, some of the group decided to head down, whilst Calum, Jim, Laura, Daniel, Ben and myself decided to head on. By the time we reached the summit of Cruach Ardain (which we later discovered wasn’t actually the summit; how frustrating! ), it was already dark and as we didn’t fancy adding an extra couple of hours navigating in the pitch black out to Beinn Tulaichean and back, we decided to head down instead. Great views when the clouds cleared! That evening, the campsite owners were hosting a bonfire and firework display. We received a phonecall just after leaving our final summit to say our van would need to be moved as it was too close to where the fire was going to be (Daniel had the keys), but when we returned we found they’d decided to crack on without us and instead had left a good layer of ash on the van. More annoyingly, they showed clear disregard for any tents nearby (i.e., ours) and gave them a good coating of ash as well. 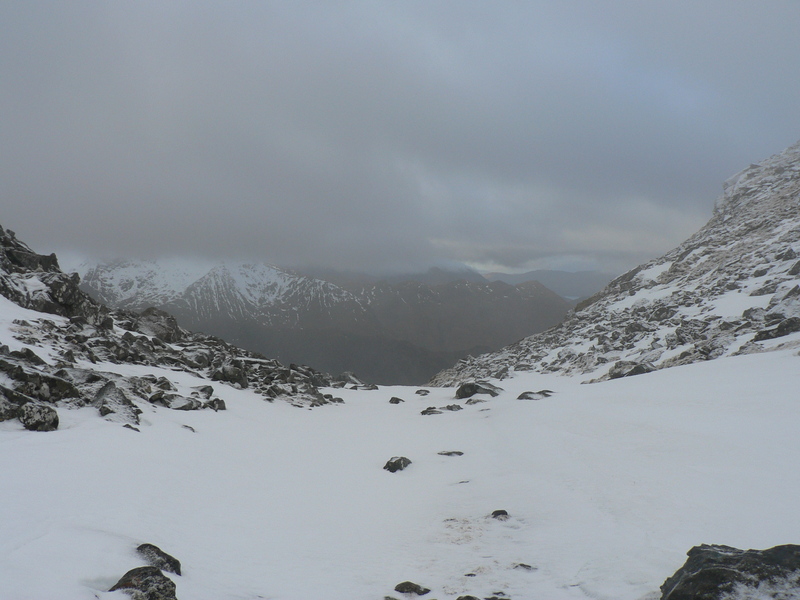 The forecast was much better for the Sunday, and as I decided it was about time that I run up my first Munro. I’d weighed up the snow the day before and decided it wasn’t icy enough to warrant crampons, and that fell running shoes would be fine. 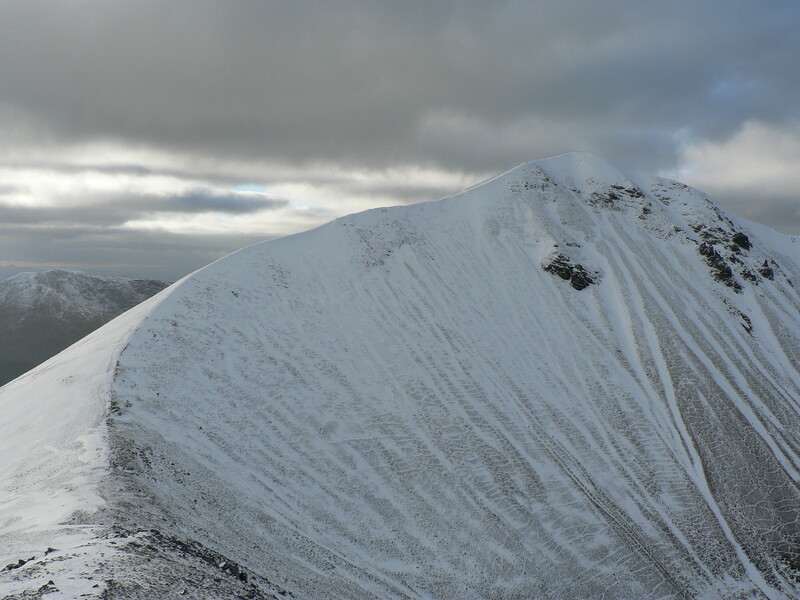 Of course, I had in mind that I might need to turn back before the summit of my target – the most western of the five behind the campsite: Beinn Chabhair. 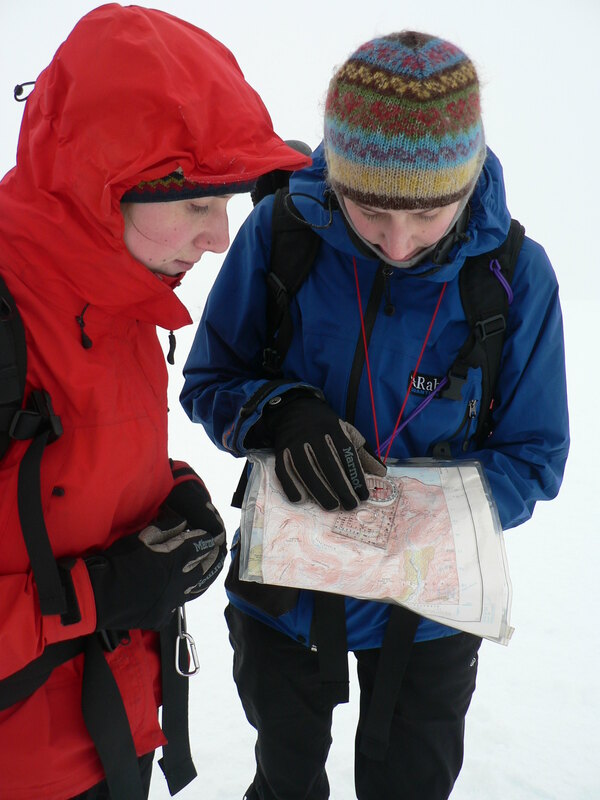 The weather was perfect, and the bog to Lochan Beinn Chabhair fortunately frozen – for the ascent at least! It took me 52 minutes to run the 3km and 500m ascent to the lochan, with a few stops to de-layer and take on some food. A lot of time was spent skirting around unfrozen sections of the bog. From there, where there were another few guys starting their ascents, I started the wade up onto Meall nan Tarmachain on Beinn Chabhair’s north-western ridge. 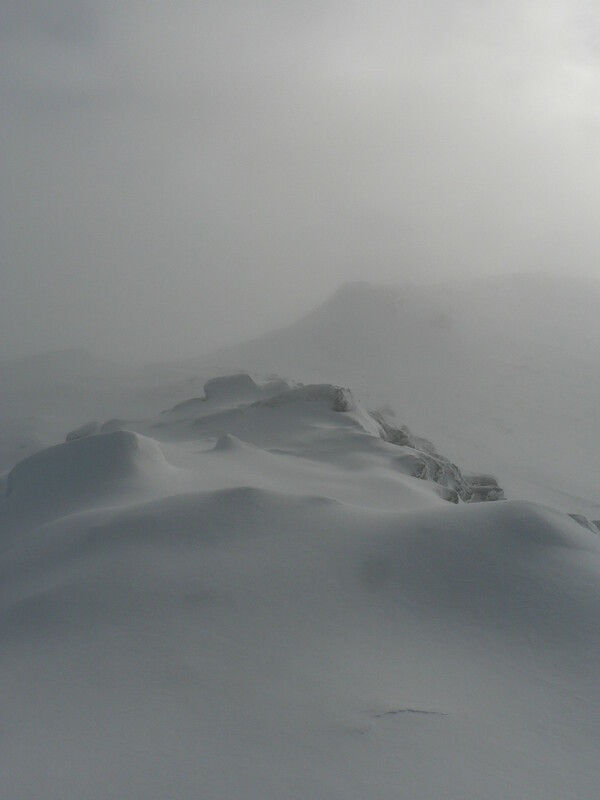 The “ridge” was very undulating, with chest-high snow drifts in places, and by the time I reached the summit I was feeling physically drained. I finished off my first PowerBar, started on my second (my “emergency” one) and ate a handful of snow, before slipping and sliding my way back along the ridge and down to the lochan. The descent was, fortunately, effortless, and I did literally slide most of the way down. I really enjoy descending in deep snow! View from the ascent of Beinn Chabhair. I didn’t take my camera, so had to rely on my phone. By the time I was back at the lochan, my feet had recovered from the near-frostbitten state they were in on the way up (note to self: must invest in some waterproof socks) and the PowerBars had started to work their magic. The run back to the campsite was very enjoyable – despite an excessive amount of bog-wading – and I took the time to take in the surroundings in the euphoric I’ve-just-ran-up-my-first-Munro, my-toes-don’t-have-frostbite state I was in. 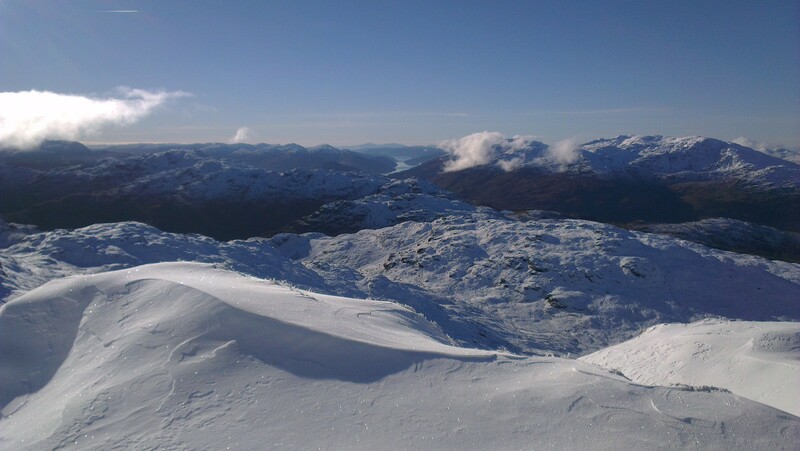 I can’t wait to get some more Munro runs in over the winter! Last Saturday was the Great Whernside fell race, an annual affair starting from the village of Kettlewell in the Yorkshire Dales. I’m gradually getting back into the running and so thought it about time I enter my first race in 18 months. I wasn’t sure how my fitness would compare with how it was before I got injured, and so didn’t really have a clue where I would come in the race. The route is a classic and relentless 4-mile straight up and down, with barely any respite in either direction. Intense would be an apt description, as right from the off you are thrown up a barely-runable field, before being let loose onto the energy-zapping, shoe-snatching bogs that, whilst being slightly flatter, are equally as draining. A few rockier sections in between where a welcome break, despite being the steepest parts of the race. The descent is equally as punishing, not necessarily because of the terrain, but because it is fast. I set out in around 30th position and soon worked my way up to 20th by the end of the first field. Lactic acid was pumping through my legs and my breathing was laboured, but I felt surprisingly good and decided to push on at the same pace. I picked up another couple of places over the next mile or so to put myself in around 15th at the summit. I naively thought that I would get a rest on the way down, but I realised this wouldn’t be the case as the guy in front set off back down at a blistering pace. I was soon overtaken by a few others, by managed to hang on to 18th position by none-less-than a sprint all the way down. I took a few tumbles in the tussocky bog, but fortunately didn’t do myself any injuries. I was a mere few seconds from 17th place at the finish – perhaps had the race been 200m longer I would have got it – but in the end I was very pleased with my 36:25, especially when compared with the winning time of 31:49 from Ian Holmes. Can’t wait until the next race! Thanks to Woodentops for the great pictures! The weather forecast was pretty dismal for second weekend that I had in Grenoble, and so a weekend trip to bag another Alpine peaks were out of the question! Instead, I turned my attention to a smaller but equally as impressive peak in the immediate vicinity of Grenoble: La Grande Moucherolle. The public transport around Grenoble and its suburbs is fantastic, with frequent bus services reaching the base of many good walks in the area. We had been given a ticket pre-loaded with ten TAG journeys on urban buses and trams, and when planning for the second weekend I was there, I was pleasantly surprised when I discovered that I could get as far as les Saillants-du-Gua (about an hour away by bus) using the ticket on the number 17 bus. There is also another “Flex” bus service from les Saillants to Prélenfrey, but this has to be booked in advance (and owing to the ever-changing weather forecast I hadn’t got around to planning a route until the Friday evening – too late to book!). This left me with 1900m of ascent to the summit of my objective for the day – La Grande Moucherolle – and I decided this would be worth it to make the most of the free transport. The forecast was pretty terrible, and the rain was meant to start around midday at the latest. Hence, I opted for an early start, and after catching the 7am bus from Trois Dauphins, I was walking by 8am. The first part of the route was nothing but a drag – for the sake of saving time and getting into the mountains as quickly as possible, I’d opted to walk along the road. A few hours and 600m of ascent later, I arrived in Prélenfrey, already feeling tired. Fortunately, my route then took me off-road and wound its way up through forest tracks to eventually reach the Barquette des Clos, a small shelter perched on the impressive Balcon Est. I was relying on there being a source of water at the shelter, as I had read previously, but upon reaching the so-called source I was dismayed to find it was completely dry. I decided to press on, but keep a careful eye on how much I was drinking. The rain that was forecast hadn’t materialised either, and the sun had made an appearance, making the lack of water even more frustrating. 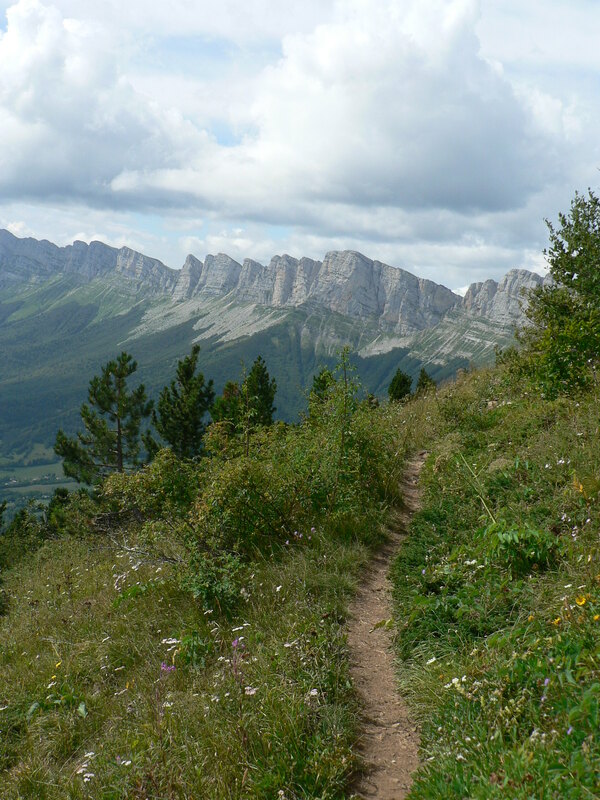 My route to la Grande Moucherolle was via the Col des Deux Soeurs, which is gained via a loose scree gully between the Deux Soeurs, with a few rocky steps of British grade I scrambling standard. There are vague signposts to the col, but they are not necessarily to be relied upon. 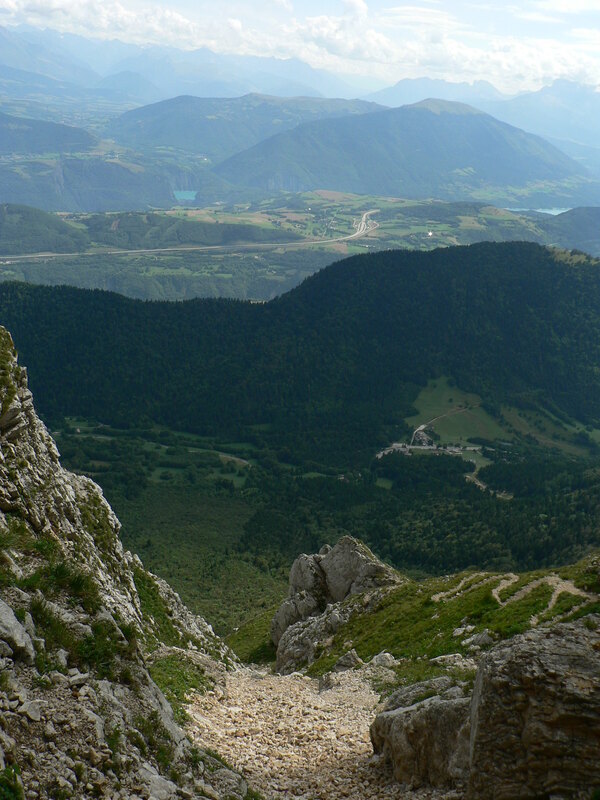 From the Barquette des Clos, the best route is to follow the Balcon Est for a few kilometres until you are directly above a refuge at the top of the Col de l’Arzelier telesieges. Here, a good path branches off right and zigzags its way up the grassy slopes beneath the cliffs of the Deux Souers. 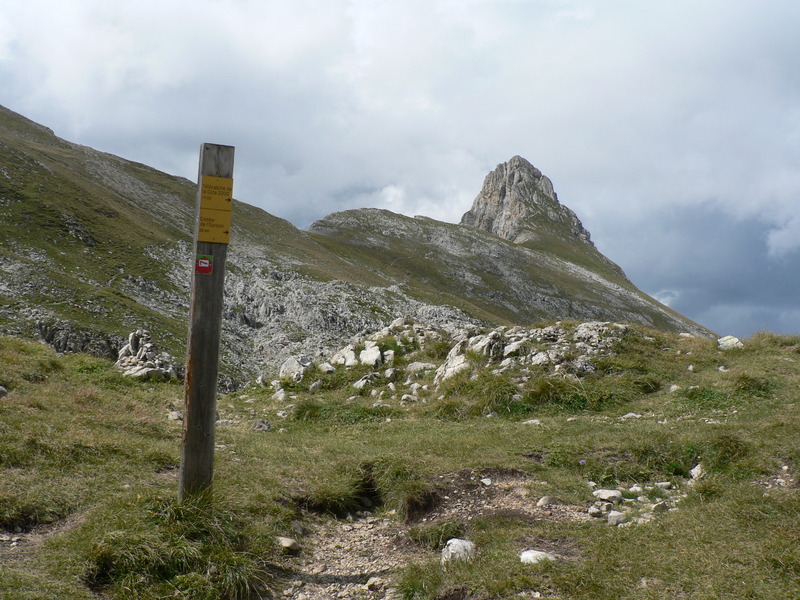 Upon reaching the base of the cliffs, it traverses northwards back towards the col. A signpost marks the obvious start to the route up to the col. It isn’t until you reach the base of these cliffs that you truly realise their scale, which is quite breathtaking and also intimidating, especially when traversing under then. 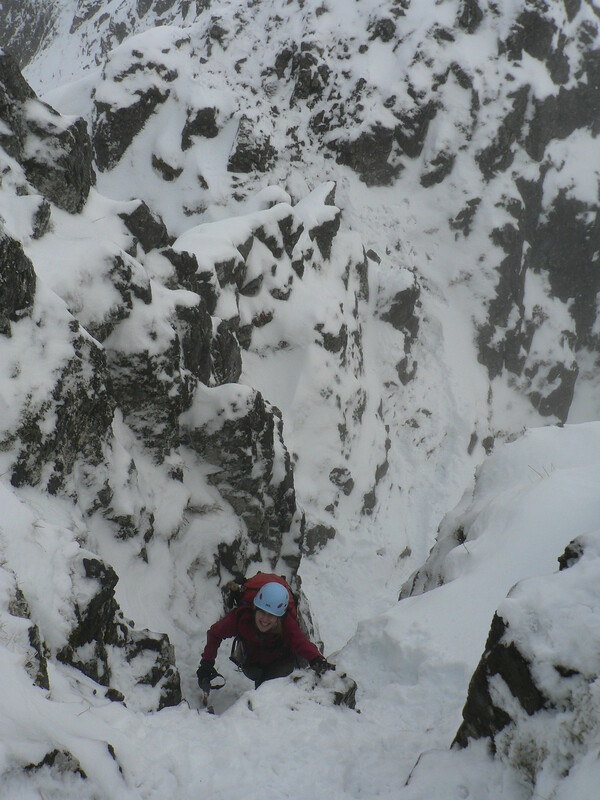 The gully to the col didn’t pose too many difficulties, but was a little loose in places. 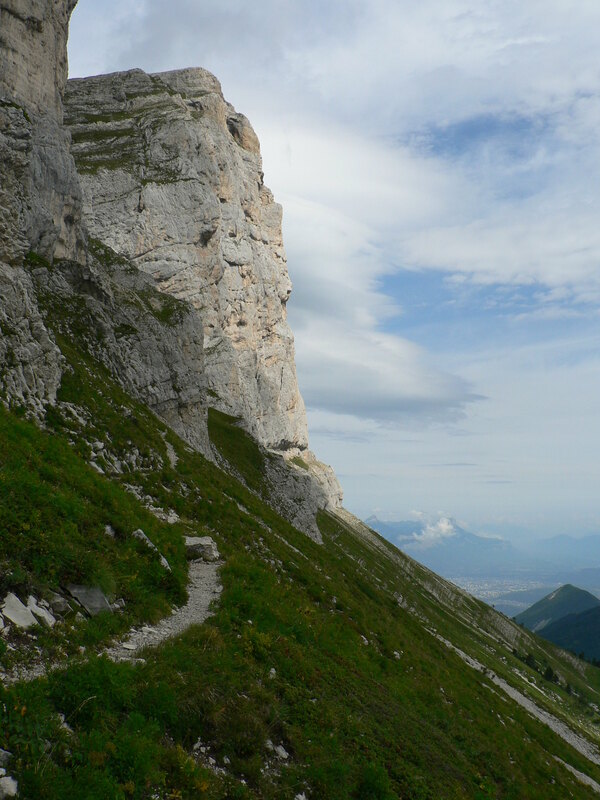 I had a bite to eat once at the col, enjoying the unique limestone landscape that makes up the Vercors plateau, before taking a vague path that lead to the base of the eastern ridge up la Grande Moucherolle, a ridge which warrants an Alpine grade of F, and felt around I/II British scrambling grade. It is a little exposed in places, especially at the top, but there are quite a few options to limit the exposure. I couldn’t see any need for a rope, unless your party is particularly inexperienced. 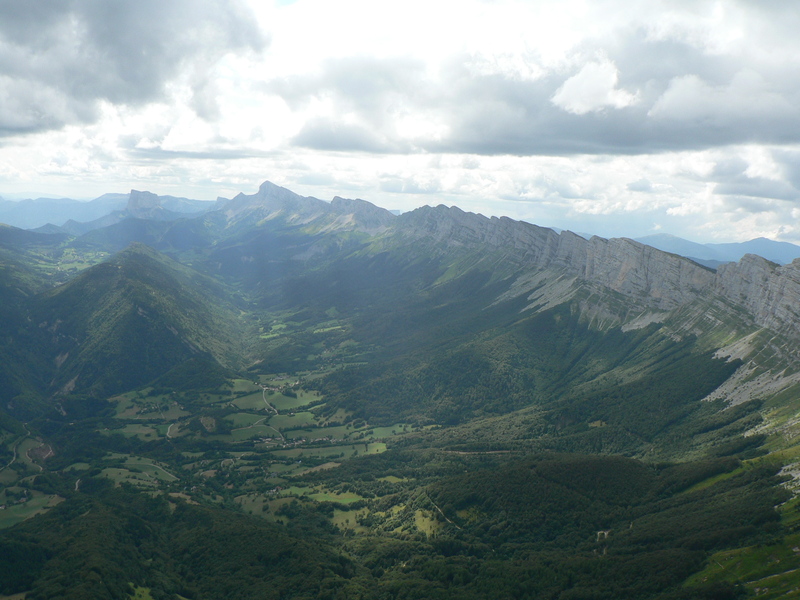 The summit commands an extensive view southwards across the Vercors plateau, and despite being very tired from the climbing and dehydrated from my lack of water, I decided the it was definitely the worth the ascent. It helped that I had the summit to myself, and I spent quite a while taking in the view. The time was now mid-afternoon and I was conscious that the last bus back of the day was at 7pm. With this is mind, I threw away my original plan of descending via the Pas de l’Oeille, and instead went back the same way as I ascended. The descent dragged on and on, and by the time I reached les Saillants, I was tired and completely dehydrated. I hadn’t paid too much attention to the actual distance of the route – as I previously mentioned, the planning was a bit last minute – and so I was very surprised that when I had a closer look at the map that it came to a shade under 30km. No wonder my legs were aching! I had a quick coffee in a coffee opposite the bus stop, before catching the 6pm bus back. Strangely, the weather had stayed dry all day, and did so until the minute I stepped back inside my appartment – perfect!